Acknowledgements. Introduction. Part 1. Reviews of media. Microbiological assessment of culture media - comparison and statistical evaluation of methods. Principles involved in the detection end enumeration of clostridia in foods. Media for the detection and enumeration of Bacillus cereus in foods. Culture media for enterococci in group D streptococci. Culture media and methods for the isolation of Listeria monocytogenes. Media used in the detection and enumeration of Staphylococcus aureus. Culture media for non-sporulating Gram-positive food spoilage bacteria. Media for Aeromonas spp., Plesiomonas shigelloides and Pseudomonas spp. from food and environment. Culture media for the isolation of camphylobacters. 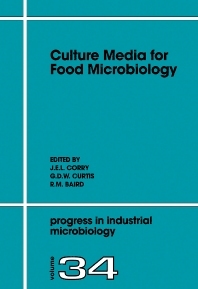 Media for coliforms, Escherichia coli and 'total' Enterobacteriaceae. Media for salmonella. Culture media for the isolation and enumeration of pathogenic Vibrio species in foods and environmental samples. Isolation of Yersinia enterocolitica from foods. Media for detecting and enumerating yeasts and moulds. Part 2. Pharmacopoeia of culture media. Notes on the use of monographs. Summary of organisms and recommended media. Monographs. Due to space limitations the 72 monographs have not been listed. Appendix I. Testing methods for use in quality assurance of culture media. Appendix II. Test strains. Index. 1) Data on the composition, preparation, mode of use and quality control of various culture media used for the detection of food borne microbes. 2) Reviews of several of these media, considering their selectivity and productivity and comparative performance of alternative media. Microbiologists specializing in food and related areas will find this book particularly useful.